Both of these expressions have nearly identical meanings and are used to describe something or someone as being really, really, excellent, as well as new and exciting, with a little bit of sexiness thrown in. Alice White, 1920s and early 30s film star in pajamas and in such films as Show Girl, Naughty Baby, and Hot Stuff, to name a few. Because they sound dated, “the cat’s pajamas” and “the cat’s meow” are used today to provide an added effect of quaintness and coyness to a conversation. But people will know what you’re getting at if you use these expressions. They still convey the meaning of zingy special-ness that the phrases had during the Roaring Twenties, when these feline figures of speech seemed to have sprung out of nowhere to become immensely popular across America. 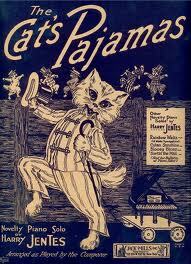 The Cat’s Pajamas sheet music from the 1920s. As usual in this blog I try to get at the origins of idioms I’m curious about or have an affection for, but interestingly enough, the research available on the Web regarding these two phrases is pretty sparse and perhaps not that reliable. Several word sleuths think a well-known newspaper cartoonist of the day, Thomas A. Dorgan (1877-1929), created, or at least popularized the phrases but I didn’t see any citings of his comic strips to support that idea. Maybe, though, the story behind these two idioms is staring us in the face with twinkly cat eyes. Maybe the phrases spontaneously self-generated when some flappers or other hipsters of the 1920s visualized a cat wearing pajamas and thought that the sight would be quite “nifty” in itself and could be used to signify other people or things that were nifty, too. (“Nifty” is slang from the same decade for what we would now call “cool.”) Pajamas as a sleepwear style were first introduced to America in the 1920s and were considered quite fashion forward at the time. And if the idea of a cat wearing pajamas could be so delightful, the same could be said about whatever might make a cat meow in delight. And thus, two figures of speech were born. Well, that’s my theory. Anyway, by 1922, The New York Times quoted an unidentified flapper as describing a sundae as “the cat’s meow,” and by 1926 “the cat’s pajamas” was well known enough for Hollywood to use the phrase for the title of a comedy involving a cat, a seamstress, and an operatic tenor. Felix the Cat, a hit cartoon figure of the silent film era, whose popularity faded with the advent of sound, to be replaced by newcomer Mickey Mouse. It could be said that people in that wild decade were fixated on cats, among other things such as flagpole sitting and gold fish swallowing. 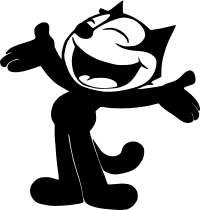 After all, Felix the Cat was a favorite silent movie cartoon figure at the time, and a character called Krazy Kat was the main protagonist of a long running newspaper comic strip of the same name (1913 through 1944). 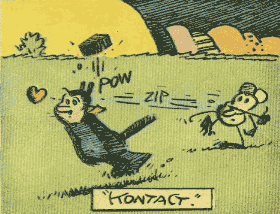 Krazy Kat by cartoonist George Herriman. Talking cartoon figure Betty Boop first appeared in 1930, one year too late for the “Roaring Twenties.” But Ms. Boop personified that decade’s “flapper” female: adventurous, vivacious, provocative, and resourceful. She was, and is, the cat’s pajamas. Click to see Betty sing House Cleaning Blues. Marilyn plays Sugar Kane Kowalczyk, singer and ukulele player in a 1920s all-female band with the exception of actors Tony Curtis (saxophone) and Jack Lemmon (base) who are masquerading as women in their attempt to hide after witnessing a gangland massacre. 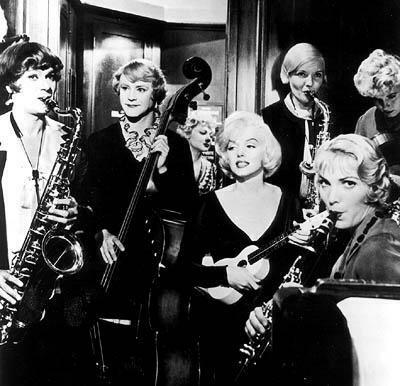 Marilyn IS the cat’s meow, forever. Click to watch her sing Running Wild from the film. 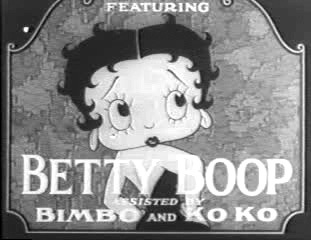 So this blog ends with the two individuals who to me personify “the cat’s pajamas” and “the cat’s meow” – Betty Boop and Marilyn Monroe. Any arguments? No, I didn’t think so. This entry was posted on Monday, June 10th, 2013 at 5:33 pmand is filed under . You can follow any responses to this entry through the RSS 2.0 feed. You can leave a response, or trackback from your own site. Thanks for referencing Disappearing Idioms. Readers might want to check out an interesting new blog, jeweltalley.wordpress.com, that also deals with, among other things, word and idiom origins. I came across your post trying to find a song lyric with this term. I found this explanation on another site: The term “cat’s pajamas” comes from E.B. Katz, an English tailor of the late 1700’s and early 1800’s, who made the finest silk pajamas for royalty and other wealth patrons. This phrase is often likened to and/or confused with the 20’s term “cat’s meow”.